range of sounds included in human language. the transition from mucous membrane to skin, which covers most of the body. The mouth plays an important role in eating, drinking, breathing and speaking. nourishment using their lips and jaw. The mouth also helps in chewing and biting food. lips mark the transition from skin to moist mucous membrane. are located in front of the ears and behind the angle of the jaw. located in the floor of the mouth beneath the tongue. arches and hugs the teeth. average person has 32 permanent teeth – 16 in the upper jaw and 16 in the bottom jaw. and say ‘ah’ is called the uvula. tongue helps us to taste, speak and swallow. the mouth, including the inner cheeks. Dry mouth - lack of enough saliva, caused by some medicine. Cleaning or rinsing the mouth after meals should be done. Breathe through the nose. Breathing through the mouth makes the mouth dry. Brush teeth every morning, after meals and at bedtime. Floss regularly. If a person wears dentures, he/she should rinse mouth and dentures after every meal. Eat a well-balanced , low sugar diet. Chew on raw salads. It encourages saliva formation. water is drunk after chewing and consuming the fennel seeds. available in powdered form too. eaten after a hearty heavy indian traditional meal. Avoid tabacco and its products. Abstain from cigarettes, snuff , pipes or cigars. Tom's mouth. Undeterred , he continued with his studies and earned a college degree. I was looking at gooseberries for my A to Z theme, but I could not really find any stories... now I wonder what they taste like! Indian gooseberries are a but sour to taste. We pickle them and store it. they are available in dried form too. Thanks A Tarkabarka H for dropping by. I am scared of visiting the dental clinic but I know I have to. Thanks Namratha. I am not fond of pan at all, but I like fennel seeds, which I chew to feel fresh in my mouth. I do visit my dentist, almost regularly. I have started to like meetha paan. Thanks Shilpa Gupte. Human-being is such a wonderful creation with so many parts in our body! Do visit the dentist soon, Anita. I am petrified sitting on the dentist's chair but never miss an appointment. Thanks Anita for visiting my blog. Once again loads of information here, Kalpana. I love meetha paan and try to have it when I can. Same pinch, Rachna. I too love meetha paan with added gulkand. Lots more facts to chew on! The mouth is certainly a busy place. More facts and mukhvas to chew on and the mouth is always a busy place. Eating and talking are done by the mouth. Thanks Keith and I am enjoying your stories. The new shop opened in Jaipur must be having lots of patrons. I am a bit choosy where mouth fresheners are considered.Thanks Chicky K for visiting my blog. When things are running smoothly we dont realize the importance of our body parts. Thanks Sundari V. for reading and commenting. Interesting post, mouth is such an important element in human body. Teeth too. Mouth is an important organ of the body. Thanks Frederique for visitn gmy blog. I used to get thrushes when there would be a very small circular white patch that would be painful, but these used to disappear by themselves. And of course I have a perpetual mouth dryness problem because of the side effects of other medicines I take. As regards thrushes they have stopped now. The body mechanism runs smoothly and any ailment/prob throws the body out of gear. Thanks Jai for dropping by. I love mukhwas and pan. Unfortunately my visits to dentists have gone on a high for the past couple of years. There have been rct treatments for not taking enough care of my teeth in the mouth. I really enjoy reading your informative and unique posts on the parts of the body. I too have 2 RC done on my teeth and I have to admit that the visits to my dentists are fraught with tension. Thanks Sonia C.
Yup, visit the dentist for 3 cleanings a year; won't talk about root canals and crowns. The problem with my mouth is that it loves chocolate. 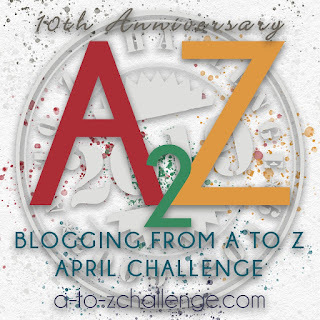 Thanks for visiting my site for AtoZ so I could add you to my blog roll. Thanks GAILM B for visiting my blog. Interesting and informative post. I dont like mouth fresheners much, but a friend has such new and innovative kinds at her place. She shops for them in kilos!! Some people make elaborate mukhvas at home before weddings in kilos. Thanks shilpa garg for dropping by. Informative write up on mouth! I like mukhwvas and also occasional paan! There is place in CP in Delhi which also offers variety of Paan like chocolate paan etc. Also one of my relatives keep variety of mukhvas at her home. I love to admire the various textures and colours of the mukhvas kept at the Mukhvas counter at weddings. Thanks Kislaya G for stopping by. I visit my dentist twice a year for a cleaning and checkup. I am fortunate to have healthy teeth and gums. Brushing and flossing are important, and I feel better after having done so. You are lucky to have a healthy set of teeth. It take a lot of effort to maintain them. Thanks Alice G for visiting my blog.